#ITGuy: Why You Hate your Tech Job | SanjayComedy...one word. I grew up in what I’m going to assume are similar circumstances as yourself. I enjoyed playing games, hanging out with friends and checking off each milestone in life as it came. I wasn’t begging for food, but I wasn’t 16 with an Audi on my first major birthday either. At first I wanted to do well in high school, so I could get into the right college. Then I wanted to do well in college so I could get into the right job (not career), and eventually parlay that into the right graduate school and/or romantic interests. Rinse and repeat, and then hopefully settle into cruise control by the age of 25. The problem with that approach was (and is) that only once I was stable and settled, riding along the highway called life that I really got the faintest idea of where I wanted my life to go. I mean once you have the time to enjoy the drive rather than finish the race, you tend to look around. This is not some article about follow the arts or how corporate life is so boring and stupid. On the contrary, as I’ve said various times online, I’m a huge fan of going into the machine and recognizing the pros and cons of that life style. Rather, since I get a few messages every week from jaded engineers and people who are curious why I am (or appear) to be so happy and joyful about my tech experiences, I thought I’d jot them down here. So, if I grabbed your attention with the headline, let’s get right into some explanation and tips on why you’re a twenty or thirty something with a decent salary, great professional and social prospects and sadly….still miserable. Most tech jobs will have a cool sounding job description like “Ability to work on cutting edge enterprise technologies. Innovation and Leadership required to interface with senior management professionals across a set of global clients.” Which makes you think you’re gonna be hacking away some revolutionary big data code while on a private jet surrounded by the attractive female (or dude) of your choice. 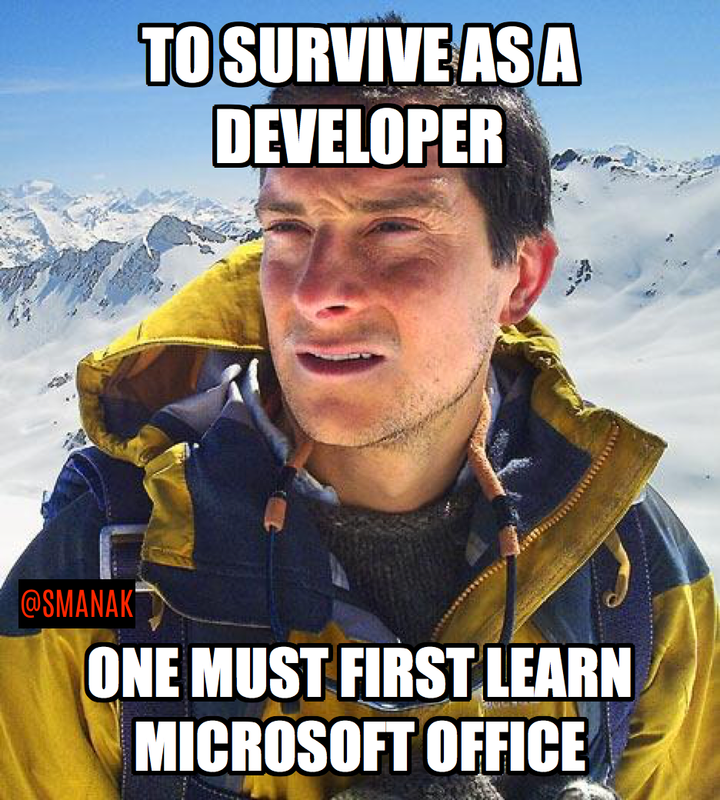 But in reality, you’ll spend your first year getting to know Microsoft Office and googling around to figure out the little software stuff you are doing. When I was 16 at birthday parties and the aunties would say “Oh look at Suman’s son Tarun, he is an Engineer at Sony” I would imagine good old Tarun working with some NFL quarterback on motion capture for the next Madden game, when in reality he was probably writing the index pages on the PDF manual. In Spanish. This is completely fine, normal and expected. Since you’ve chosen the safety net of a stable job/company (as did I), nobody is going to hand you the keys to the kingdom on day one. Get to know your area, master it, and then grow from there. Others will come to take your place and it’s up to you grow beyond it rather then get complacent, miserable and simply resent it. You might be the guy raising tickets to users have access to a system, you might be testing software and filing bugs, or you might actually be out of your comfort zone coding away from the get go. Either way, it is completely normal. Problem: What the Hell do you really want? And Why? I’ve had so many people in various companies, both while working in India and the US tell me things like “Sir I want to be a Business Analyst” or “Sir I want to go Onshore.” These are generally kids in their early twenties who don’t really have an interest in what they’re doing, but they’re more interested in job titles, travel experience, and financial incentives which will eventually steer them towards the things they really want to do. I’ve been in the same boat, and how to get that onshore role is a whole other article, but only once you’re honest with yourself about what you want will you start making moves (e.g. Turning down projects/jobs which might not get you there) that will help in getting those things. And secondly, when I ask these kids “Why do you want to go Onshore?” or “Do you know what a business analysts does?” the answers are typically revolved around the fun parts of it and the less coding involved. The majority of freshers I see at most companies come into the machine, get placed into a project and then get lost into the ether from there. Some leave after a few years to find something else. Some get married. Others stick it out. But NOBODY in a large company who is fighting these same battles themselves is going to come down and give you what you want if you don’t know yourself. And ESPECIALLY if you don’t make it known. People who work in technology are special. We tend to be of the mindset that we could do any job, but not anybody could do our job. It’s kind of like “I got a computer science degree buddy. Marketing, Sales, HR? That’s child’s play.” But not respecting the pros of those fields tend to hinder our own progress. We don’t speak up. We don’t look internally to figure out what drives us aside from being good at the jobs/software/tools that depend on us. And a good chunk of us are unhappy and always hunting for that “next thing.” And the majority of us (myself included) do absolutely nothing about it. Ask yourself, if you spend even 5% of the time you spend complaining about your situation on actually trying to fix it (e.g. learning a new skill, speaking to your manager, working part-time elsewhere in a new field), would you really have anything to complain about? Bang on Sanjay. Very well said. I think everyone in this field faces these problems. But i guess the hardest part is finding your true calling right, we spend almost half our life doing something we think will get us somewhere in life because thats what we’ve been told , when in truth mentally it gets us nowhere. No contentment, no satisfaction, no serenity. I guess thats the hardest part for all of us…not just for ppl like us from from S/W but for everyone. To find what we truly cherish and want to do :). well said sanjay.. agree. but sometimes these are not in your hands.. all u can do just try..